The bid to host the 2018 Gay Games in London began with a reception in Westminster last night. The gathering at Portcullis House was hosted by Liberal Democrat MP Stephen Gilbert. MPs, local government members, and athletes were among those who turned up to show their support for the cause. The Gay Games run once every four years and comprise of a sporting, cultural, and human rights festival that encourages participation without discriminating by sexuality or ability. John Bercow, Speaker for the House of Commons, spoke to the room about the evolution in LGBT rights that has taken place in the UK, calling it a “vastly more inclusive and respectful place” than it was ten years ago. He concluded that the bid was a “noble cause” that should be supported by straight people as well as the LGBT community. 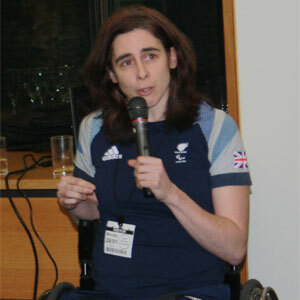 “What the Paralympics did this year was it opened up a discussion about disability, it exposed the wider community to disabled people in a way that they hadn’t had before. It gave people that platform and that forum to ask the questions that they wanted to ask, to see people in different formats doing things that they didn’t think they could do, to break down some of those myths and demystify some things around a very closed community. “I think London 2018 is a great opportunity for us to do that for the LGBT community – particularly the T community, because I think within the LGBT community it’s also a good opportunity for us to see the diversity amongst us,” she said. Swim coach and London 2018 bid chairperson Alex Davis recalled the low numbers of openly gay athletes who participated in the Olympics, and said that the games would “change and shape the attitudes towards LGBT people” in countries where sexuality and gender are still matters for criminal law. When fundraising began in October it emerged that London was competing against Amsterdam, Paris, Limerick, and Orlando to host the 2018 games. Each will put in a bid at the end of February, after which the three official candidate cities will be announced. The final decision will be declared in autumn 2013.